On Friday, May 11, the UMSL College of Optometry honored 39 young doctors at a beautiful graduation ceremony at the Touhill Performing Arts Center. Graduates had the opportunity to listen to one of the most prestigious leaders in the profession, Dr. Arol Augsburger, who presented the keynote address. Dr. Augsburger retired as President of the Illinois College of Optometry. He has the incredible dual distinction of being elected into the National Optometry Hall of Fame and receiving the “OD of the Year” award in three different states (Illinois, Ohio, and Alabama). 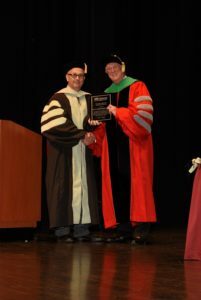 Dean Larry Davis was pleased to present Dr. Augsburger with the Dean’s Award for Meritorious Service. 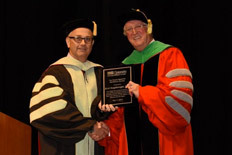 To read more about the Dr. Augsburger’s keynote address, visit: https://umsloptometry.com/2018/06/28/39-young-doctors-of-optometry-honored-at-commencement/.